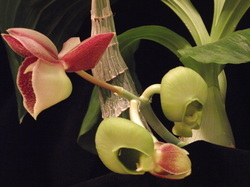 Catasetum [Ctsm.] - NATURAL - Catasetinae Canada Your Catasetinae Orchid Connection! Catasetum (Species and Hybrids) genera, awards, species checklist, slideshow, etc. Male (left) hermaphrodite (center) female (right). growers that are less sensitive to cultural mistakes, Catasetums are the most easily grown members of the Catasetinae. Floral dimorphism, the production of male, female or hermaphrodite flowers, sometimes very different from each other, is a trait that adds interest and initially caused confusion. The showier male on the left (staminate) flowers that can eject their pollinia and the yellowish-green female on the right (pistillate) flowers usually grow on separate inflorescences that arise from the base. Occasionally, hermaphroditic flowers are produced, and at times male, female and sometimes hermaphroditic flowers can all bloom on the one same inflorescence depending on specific environmental factors. For instance, growing under greater sunlight tends to produce more female flowers. Catasetinae are heavy feeders during their growing period but a dry rest period of differing lengths according to species is needed after flowering, specifically, once the plants start to drop leaves. Water is gradually reduced, then withheld. If at all, water sparingly only to prevent pseudobulbs from shrinking too much. Once new growth reaches 4 inches and new roots reach 3 or more inches long, watering is begun, with normal abundant watering taking place once the potting mix again approaches dryness. Fertilize well during the active growing season as the plant does not get a chance to be fertilized during its dry rest period. Catasetinae like humidity of 50-70% with warm day temperatures of 75-80 F (24-27 C) dropping 10-15 F (6-8 C) at night. Repot just as new growth is beginning at the end of the dry rest.